Harvest Moon: Tree of Tranquility (牧場物語 やすらぎの樹, Bokujō Monogatari: Yasuragi no Ki?) 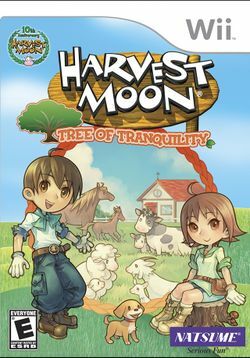 (also known as Harvest Moon: Tree of Peace) is a strategy RPG that simulates aspects of farming. It was released on June 7, 2007 by Marvelous Interactive. The game was released exclusively for Nintendo's Wii console and was the first title in the Harvest Moon series originally developed for the Wii. The player has moved to an island town that was once enchanted. However, the sacred tree of the island has died, and the island's deity has vanished. The island has lost its connection with nature and its inhabitants don't know what to do. By growing various crops and herbs, tending to and befriending animals, forming friendships, and raising a family, the player can help save the island by bringing its tree back to life. This page was last edited on 27 October 2015, at 02:44. This page has been accessed 12,987 times.